I Bare All at Cynsations! Today's post is being hosted at Cynsations. 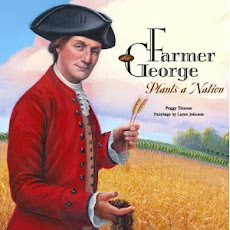 Peggy Thomas on Baring All - Anatomy of Nonfiction and Book Giveaway. Now that I see the title, I have some major regrets (the low-cut blouse is one), but I'm also afraid I will be blocked from every school computer and banned from setting foot in a school again. But if you read the article you'll understand what I mean -- it's about turning the lens on yourself, analyzing what you do, and having the guts to share the good and the bad with others. Post a comment on the guest blog at Cynsations for a chance to win a copy of Anatomy of Nonfiction and a free critique by me of a nonfiction picture book manuscript or 3 chapters of a larger nonfiction work. From everyone here at Theoretical Thursday we wish you a HAPPY THANKSGIVING! And theoretically, everything you eat today contains zero calories! 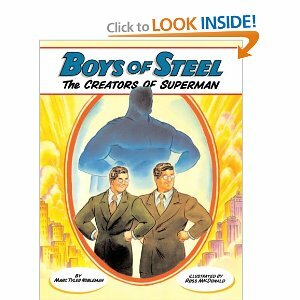 For this Nonfiction Monday I recommend Boys of Steel, The Creators of Superman by Marc Tyler Nobleman and illustrated by Ross MacDonald. It seems as though the creators of the first and most popular superhero should be common knowledge, but for a long time that information was kept quiet. But now, even kids will know that Superman was the alter ego of two boys who desperately needed one. Jerry Siegel and Joe Shuster were short, shy and lousy at sports – as tough a role to play in high school in the 30s as it is now. From the first sentence we get a feel for who Jerry Siegel was – a boy who was happier at home with his fictional friends than amid the bustling bravado of high school. Joe Shuster felt the same way and they both escaped into their comics, Jerry writing stories and Joe drawing pictures. Nobleman sprinkles this picture book biography with familiar phrases like faster than a speeding bullet; a bird, a plane; and fighting for truth and justice, and you can easily see how elements of the Superman story came from the boys’ lives. 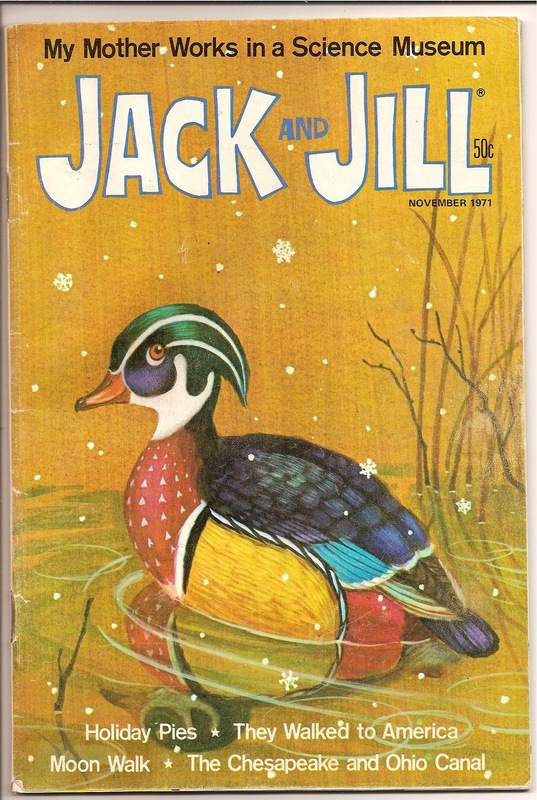 The stylized art work of Ross MacDonald is reminiscent of the classic comic book and captures the period when boys wore ties and vests to school and belted their pants at the waist! But Jerry and Joe’s feelings are universal, and today’s kids will relate. Who hasn’t at one time or another felt like they didn’t fit in. Readers will also be inspired by this team’s persistence as they pursued a dream they worked toward and believed in for years. The picture book story ends when Superman is at his peak, but the heartbreaking denouement of the story takes place in the end pages titled The Greatest Superhero of All Time. Naive and eager to get the first Superman story published, Jerry and Joe sold it and all rights to the character to DC Comics for $130! They struggled for years to get back a fraction of the profits that Superman products amassed. Poor health and poverty forced them to battle one last time when in 1975 the first movie was announced. They took their case to the public and finally achieved what they had always wanted – acknowledgement that they were the creators of Superman. Today, their names appear on every product. PT: How did you come upon Jerry and Joe's story and what aspect of it resonated with you and said, "This would be a great kid's book?" Marc: I've been a Superman fan since I learned to read. When I was in high school, Superman turned 50, and I read a book of essays about him; one told Jerry and Joe's story and I was hooked. After college, I set out to write a screenplay about them, and this was when Jerry was still alive. However, my first attempt to contact him was rebuffed so I shelved it for ten years, by which point Jerry had died and I'd started publishing children's books. Because there was no standalone book in ANY format on Jerry and Joe, and because the story is at once inspirational and heartbreaking, I saw it as a great candidate for a picture book for all ages. PT: Why did you decide to add the heartbreaking details of Jerry and Joe's legal struggles in the back matter? Other writers may have ignored it altogether, but you tackle it head on. Marc: Yet at least one critic said it should have been in the story proper rather than the afterword, which some kids won't read! As far as I'm concerned, as long as they're in the book, they're in the story. I included the hardship they encountered because the story can't end without going through that, and it's a cautionary tale for anyone who wants to create. I didn't write the book to impart a lesson, but I'm thrilled when kids (or anyone) takes away from it that you must must must protect your ideas. Some kids as young as 1st or 2nd grade are mature enough to understand that sometimes people make decisions that hurt them. PT: I noticed that your newest book is going to be about the creator of Batman. That begs the question - who is better? Do you prefer Superman or Batman and why? Marc: I started with Superman and I stand by him; though many feel he's not as textured as Batman or other human characters, he's got his flaws and weaknesses like any hero. However, when it comes to their backstories - the ones I'm writing about - it's a tie. PT: And I must ask about your newest experiment. If anyone is not familiar with Marc’s latest endeavor, he has been blogging about a story he wrote called 30 Minutes Over Oregon: The Only World War Two Bombing of an American State, that received glowing comments from editors but no offers to publish. Some editors commented on the fact that the hero ( a Japanese bomber pilot who comes back years later to apologize!) is not familiar to children. Perplexed, Marc wondered what makes a good hero, what makes a good story, and what does it take to convince an editor that you have both? He also asked illustrators to create cover designs for this book-without-a-publisher that he posted on his blog. So I asked: With all the buzz about the story and posts from writers, readers, librarians, teachers, etc, has there been any new interest from editors? Marc: The TMOO experiment has generated an overwhelming and positive response from editors, librarians, teachers, booksellers, agents, parents, and kids themselves; multiple editors have requested (or re-requested) the manuscript in its wake, and I wait eagerly and maybe not patiently enough to hear from them! I feel this book has the potential to stimulate the kind of questions no other nonfiction picture books I know of could, such as "Can someone start as an enemy and become a friend?" and "Can you be hero simply by apologizing?" Stay tuned to my blog Noblemania for updates. But then I hit a road block – theoretical explorations where things like quirks, quarks and the Higgs-Boson particle are spoken about as if they too were sitting in a wagon. As I type this sentence, I realize that my ignorance may be showing and these things are real and observable and I just haven’t understood the conversation. And that is the impetus for this experiment – I want to understand the conversation. I want to understand how very smart men and women can earn a living by making stuff up. At least that is what it seems to me, right now, in my theoretically-challenged brain. 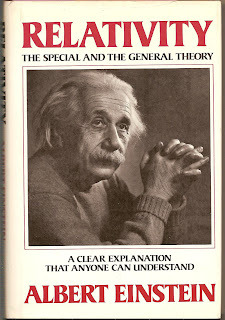 So, who better to teach me Theoretical Physics than the great man himself – Albert Einstein. 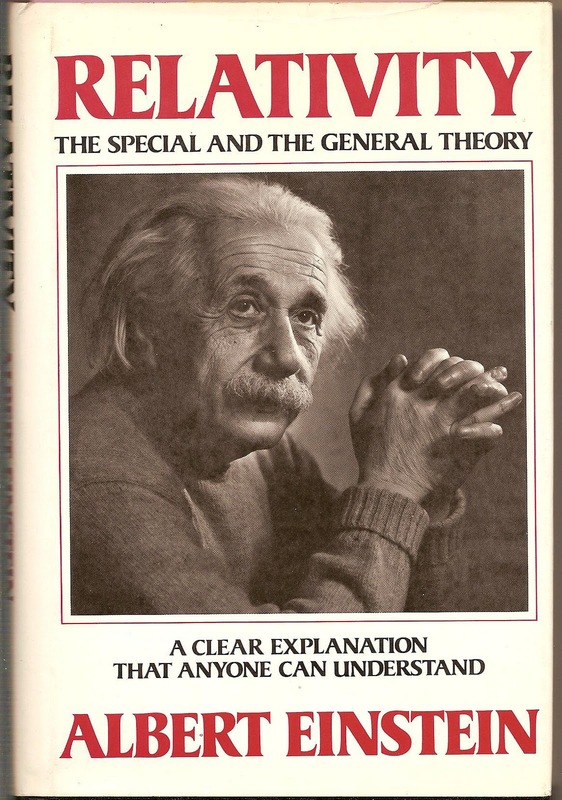 And I just happen to have his book – RELATIVITY: The Special and the General Theory, A Clear Explanation That Anyone Can Understand. (Wanna bet?) Even Einstein appears to have misgivings as he peers at me with raised eyebrows from the photo on the cover. He holds his hands in pre-wringing motion as if to say, “This job may be harder than I thought.” And I think he may be right. This book, written in MCMLXI, includes a preface. “The present book is intended, as far as possible, to give an exact insight into the theory of Relativity to those readers who, from a general scientific and philosophical point of view, are interested in the theory, but who are not conversant with the mathematical apparatus of theoretical physics.” I fit that bill – I am interested. And I am not conversant. So far so good. His next sentence (Don’t worry, I’m not going to go through the whole book sentence by sentence. I think.) presumes I have an education of a standard “corresponding to that of a university matriculation examination.” I have a Masters in Anthropology, but that probably isn’t what he meant. I suspect that exams in MCMLXI might have been more rigorous than they were when I graduated, but I can’t be sure, so I press on. That preface was written in December 1916. The edition I have is the 15th edition and on June 9th, 1952 (8 years before I was born) he wrote a short note about the addition of a 5th appendix about the “problem of space in general and on the gradual modifications of our ideas on space resulting from the influence of the relativistic view-point.” You might be cluing in that I am quoting liberally because I don’t understand what he is talking about. That does not worry me; after all, I haven’t read the book yet. When I go back and read these notes after I am well educated on all things relative, I’ll know exactly what he means. Right? He goes on to say that, “Physical objects are not in space, but these objects are spatially extended.” I like that. I am not fat, I am just spatially extended. Okay, gang. The preface was enough for today. Hit the showers. For tomorrow – read Part 1, The Special Theory of Relativity, chapter 1, Physical Meaning of Geometrical Propositions. 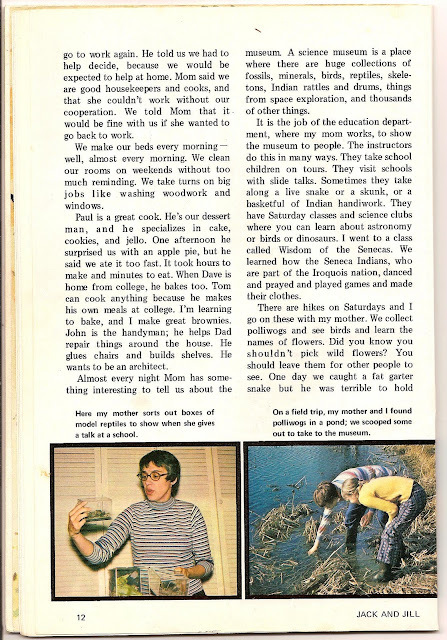 Forty years ago this month, my first article was published in Jack and Jill magazine. Well, sort of. My mother, Margery Facklam, actually wrote it with my help. At least I think I helped. I’m in the pictures anyway. The article was called “My Mother Works in a Science Museum” and tells all about my family and my mom’s job as Assistant Director of Education at the Buffalo Museum of Science. I found an old, and probably the only, surviving copy of the November issue (50 cents) while cleaning out files in my office. While lots of it makes me smile and remember things I had long forgotten, I don’t remember working with my mother to write it. 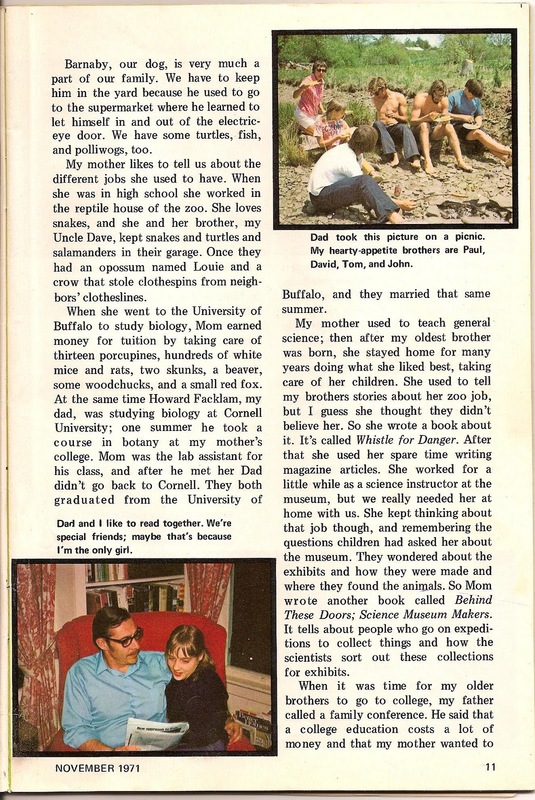 Did she interview me, or ask me how I’d describe her work or what we did as a family? The information is accurate. I was a member of safety patrol, and I did think it was fun. Our dog Barney did go to the supermarket and let himself in and out with the electric-eye door, and I do remember taking a class called the Wisdom of the Senecas, and going on Museum fieldtrips, and almost running into the backside of a cow. Lots of it sounds like a kid, but lots of it doesn’t. 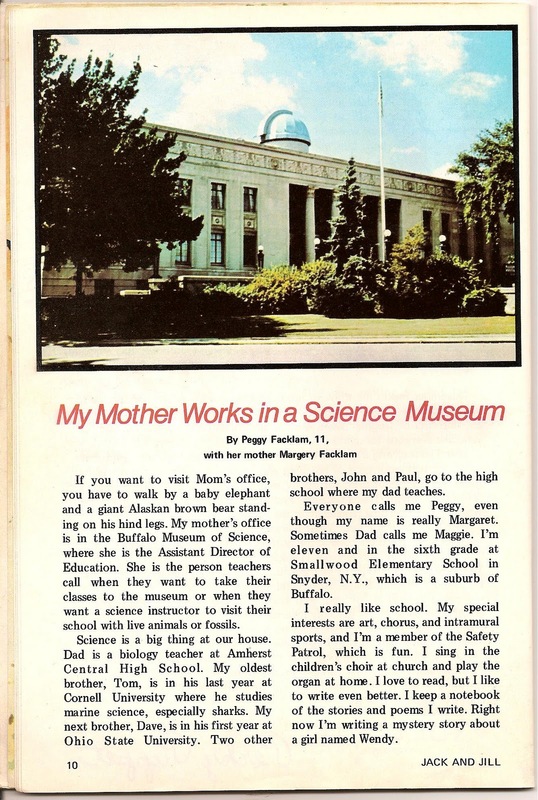 I don’t think I would have thought to write about how my mom earned her way through college or how she was trying to create a Children’s Science Activity Center at the museum and get a bus for a mobile exhibit. I hate to say it, but I was just there for the fun of it. In 6th grade I would have focused more on how cool it was to have the whole museum to myself after hours. I loved the Hall of Dinosaurs the most. I would stand in the middle of the vast room and hold my breath waiting for the bones to creak to life. One time, someone brought a young fox to the museum. I got the job of walking it on a leash out in the nearby rose garden. Another time, my mother brought me along on a trip to visit naturalists and film makers Ken and Bertie Button. I don’t remember why, but they had a baby two-toed sloth at their home. I can still feel its sharp two-inch long claws dig in as it hung from my arm. How I’d like to brag about being an accomplished writer at age 11. But I can’t. 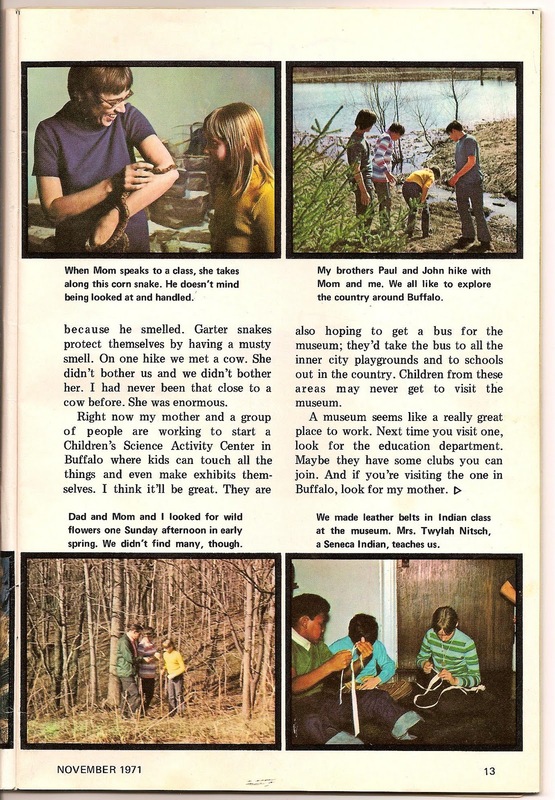 In fact when the free copies arrived in the mail at our house and mom told me to take them to school, I was mortified. The teacher stood up in front of the class and gushed over me – a real published author. Surely the teacher could see that I didn’t really write this, right? I felt like such a fraud. I stood there and read the article like a good kid, and kept my mouth shut about not really being a part of the writing process. I didn’t want my mom to look bad, either. But it always bothered me. Maybe I became a writer, in part, to redeem myself. I wanted to make good on that first fraudulent piece. Along the way, my mother and I have had a wonderful time collaborating. Our first joint effort was The Kids’ World Almanac About Money, Math and Numbers in 1992, then New York: The Empire State in 2007, and most recently, Anatomy of Nonfiction. These projects I definitely do remember. We have an easy working relationship because we both have similar working styles. After all I did learn from her. We usually divide up the project, each taking a chapter or subject to work on, and then get together once a week or so to share notes and revise. For the first two books, my mom was senior author. She had the job of going over the entire manuscript making sure we were of one voice. But for our last project, we sort of traded places. In her 80s, she was happy for me to take on the extra work corresponding with our editors, answering queries, verifying facts, and smoothing out voice. And we have come full circle. Sometimes, she is the one who doesn’t remember our collaboration. Another great day at the Rochester Children’s Book Festival. If you have never been, it is worth the trip. A chance to meet more than 40 authors and illustrators, to peruse hundreds of children’s books, make crafts with your kids, listen to stories, learn how some of your favorite authors work, and generally steep yourself in all things wonderful. From 10 to 4 I was busy talking with kids and parents, teachers and librarians, and future authors. I was thrilled that my newest book, For The Birds: The Life of Roger Tory Peterson was so well received. More than once a child zoomed up, grabbed the book and said, “Oh Wow!” or “This is the one.” When I asked if they liked birds, they would nod vigorously. “Yeah!” Those are the kids I write for. The ones who have a passion to learn. They already have a fire inside of them that is just waiting to be stoked with just the right fuel – true stories. I imagine those are the kids that someday might grow up to be scientists, journalists, teachers, librarians, or nonfiction writers. I also met several writers struggling to break into publishing. One woman has written a biography about a relative of hers who was the “father of American apiculture.” He was the person to figure out the “bee space” the specific distance that bees maintain between honeycombs. This allowed bee keepers to create bee boxes with walls that slide in and out without harming the bees. Another woman mentioned wanting to write about the women of the Jazz era who were not allowed to play in clubs. It is such a treat to meet people who are so fired up about a subject that they want to share it with others. 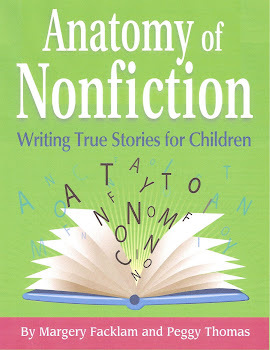 I hope my book Anatomy of Nonfiction: how to write true stories for children will help them hone their craft, so that someday I will walk into a bookstore and see a new bee book or biography of a Jazz legend. That is what I find so amazing in this children’s book business. We are all eager to share what we know, if for no other reason than to someday get to read the other person’s book. There is no competition because we all have our own projects and passions. And it behooves all of us to lend a hand. The more amazing nonfiction that is out there, the better it is for the reader, the publishers and for the writer. More fuel for the fire in all of us. My table mate busy signing books - Julie Berry (in prison garb) and Kate Messner (in blue).